Anyone who has spent significant time lake fishing, or “stillwater” fishing as we call it has gone on a wild chase for seal dubbing at some point. While it’s still available in some countries, it’s not as easy to get in the United States due to some of the laws changing. I have some that I had to twist an arm or two for, but I’m always second guessing myself when it comes time to tie up a batch of seal buggers with the secret stash. There are lots of good substitutes out there, and yes, Arizona simi seal is one of the best, but in my opinion, it’s kind of more a stand-alone product as opposed to a real substitute. Luckily, Nature’s Spirit has been putting out stellar dubbing that they call “African Goat Dubbing” and it’s got a lot of the same characteristics that seal has. It’s somewhat short, coarse, and has pretty good translucency, so it makes a great bugger or leech pattern. 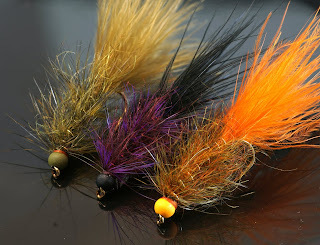 We have listed a few of our favorite combos for these buggers, so feel free to mix them up to fit your local fisheries. These flies do the trick from Argentina to Canada, so it’s worth filling a box of them! To blend the dubbing together, It’s easiest to use two dog slicker brushes and just keep brushing it together until it blends properly. Because of the unruly nature of the fibers, they will clog up a coffee grinder and they won’t separate properly using the ziploc bag technique.